Common decency and Illinois law dictates that a driver involved in an auto accident should remain on the scene and follow all instructions until it is taken care of. Unfortunately and for a number of reasons, some drivers flee the scene of an accident— whether it is a vehicle collision or after striking a pedestrian— and try to avoid penalty for their negligent actions. Hit-and-runs kill approximately 21% of people annually, according to data from the AAA Foundation of Traffic Safety, which is an enormous percentage of transportation-related fatalities. One out of every five pedestrians is predicted to be killed in a hit-and-run every year, and 66% of hit-and-runs are attributed to unlicensed drivers. It is clear when a driver flees the scene of an accident, they are attempting to avoid the repercussions of the event, and in many cases they may have suspended licenses or are driving under the influence of drugs or alcohol, which compounds their incentive to leave. If you or someone you love was injured in a hit-and-run, you might be eligible for compensation based on the pain and suffering you experienced as a result of the crash. The physical and mental anguish that comes with struggling through an auto accident without the cooperation of the negligent driver can be extremely frustrating, and the personal injury attorneys with Tapella & Eberspacher Law Firm understand how difficult this can be. To find out how we can help, call us today at (855) 522-5291 or simply fill out the “Free Case Evaluation” form located on the right side of this page at the top. It’s 100% FREE and there is no obligation to proceed. The details of your case will always remain completely confidential. Illinois law specifically requires a motorist who is involved in an accident stay at the scene until dismissed by police or the matter is otherwise settled. Being the victim of a hit-and-run crash can be frightening and frustrating, especially if the injuries sustained are life threatening. It is critical to remain calm and make a mental note of as much circumstantial information as possible. It may be tempting to try to follow the car that hit you but this is not the first priority. The most important step in the sequence is ensuring the safety and wellbeing of yourself and your passengers. Speaking to legal counsel can give you power to bring the guilty party to justice and the compensation that is awarded following a successful verdict or settlement can help cover the many medical expenses victims of hit-and-runs often incur. 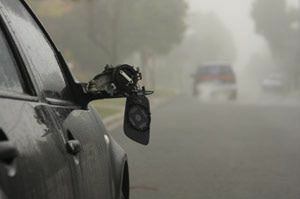 In the state of Illinois there are two levels of hit-and-run offenses, misdemeanor and felony. A misdemeanor hit-and-run involves only damage to property, while a felony hit-and-run involves injury to the other party. The negligence of hit-and-run drivers is a very serious offense, and an experienced and knowledgeable car crash lawyer can assist you in recovering the compensation you deserve and serving justice to the reckless individual who caused you and your loved ones pain. The legal team of Tapella & Eberspacher understands that hit-and-run auto accidents can cause damage beyond the victims’ physical suffering, and that reckless and negligent behavior will continue on St. Louis roadways until the responsible parties understand that their actions caused your pain and suffering. We are proud to represent the victims of auto accidents and to protect their rights during trying times. Our attorneys have the passion and knowledge to competently represent you or your loved one in court, and we want to help you fight for the MAXIMUM compensation for your auto accident. To learn more about our law firm, or to schedule your free no-obligation case review, our attorneys welcome you to contact us at 855-522-5291 where a member of our intake team will gather information regarding your auto accident case and quickly connect you with one of our caring attorneys.